I should say up front, that we are personally anti-outboard for this boat. 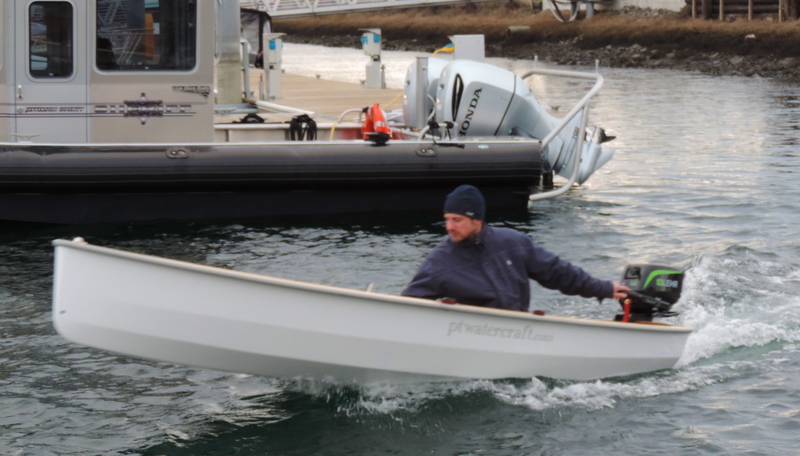 The PT 11 is lightweight with a hull shape well suited for easy, near effortless rowing, even for longer distances. The sailing rig is also very easy to use. Our vision has been that this dinghy can be a tough, utilitarian, and totally enjoyable alternative to inflatables, as tenders for cruising boats. Even so, the PT 11 can be used with a small outboard. We have calculated that a 2HP outboard would be plenty of power to move this little boat with ease and also keeps the PT 11 within a certain USCG category. In our opinion, however; those who expect to use a motor on their dinghy more often than not, might be better off with a different dinghy. One could choose a boat with a fuller aft end. Rowing performance would be compromised but these boats would plane with a 5HP motor. 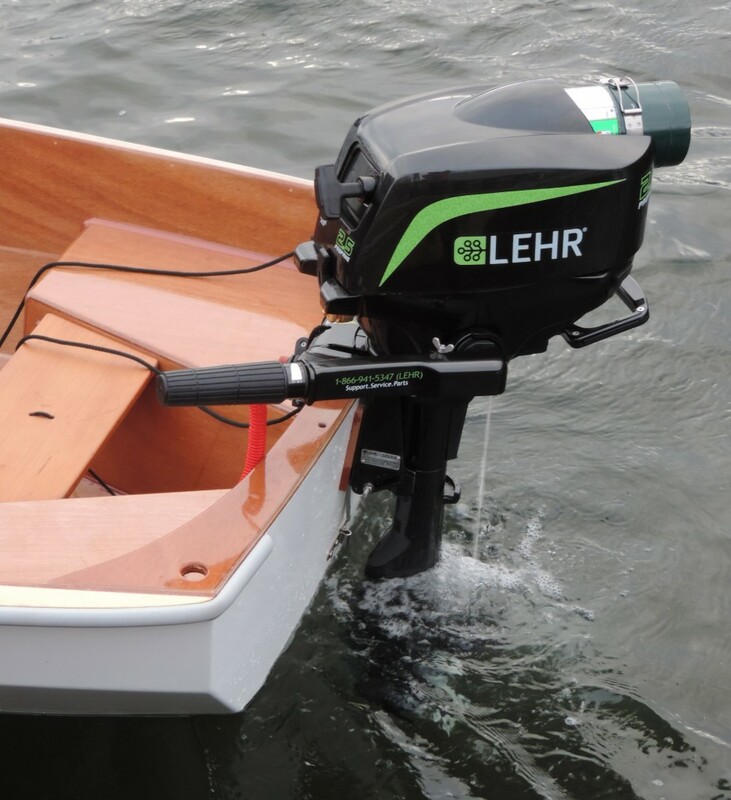 There are, it seems, few, new model outboards of 2HP or less. Most outboard producers currently have models of just over 2HP. Other than the perceived "need for speed" from the general public, we are not sure why they have chosen to discontinue lower HP motors. See a PT 11 test drive with an EP CARRY. For the sake of experiment and because this motor was offered to us for this purpose, we went ahead and made a test drive. Thank you to J.S. for this opportunity. Here is what we found and there is a link to a short video at the the end of this post. On forums online, the Honda 2.3 has been proclaimed as very noisy. Electric motors are obviously the most quiet. IV. Speed: The Lehr 2.5 propelled the PT 11 with a single, 180 pound operator, at 6.8 knots, at full throttle in protected waters. No comparisons at this time. V. Trim: The PT 11 is light weight. The weight of the motor being nearly half the weight of the boat, and with a single operator having to sit far enough aft to reach the tiller, causes the bow to ride high. One would need a tiller extension to be able to shift driver weight forward. Taking off at full throttle..
VI. 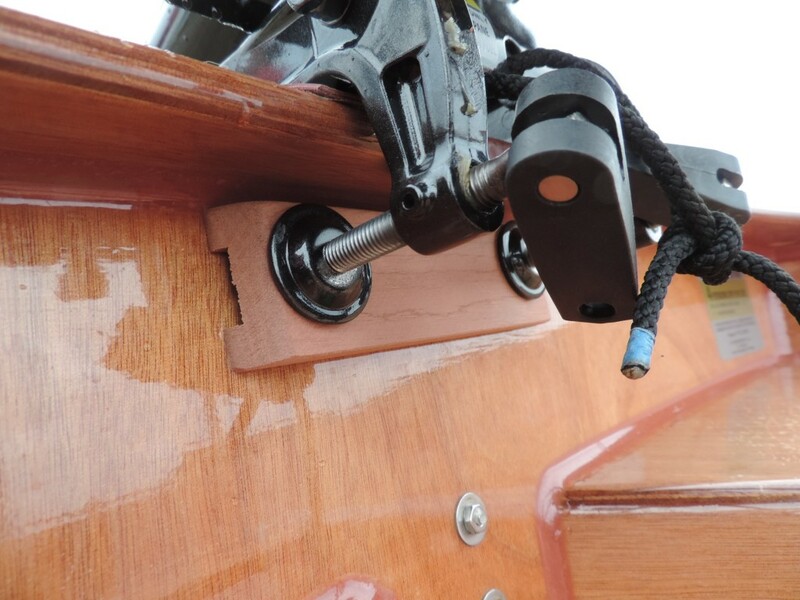 Mounting: The outboard was mounted with a raw mahogany block just below the inwhale. For the purpose of this demo, we adhered it with double sided tape. For more permanent installation, we would advise exchanging the bolts on the top gudgeon, for screws that bite into the block. On the outside of the transom, we used raw mahogany strips. 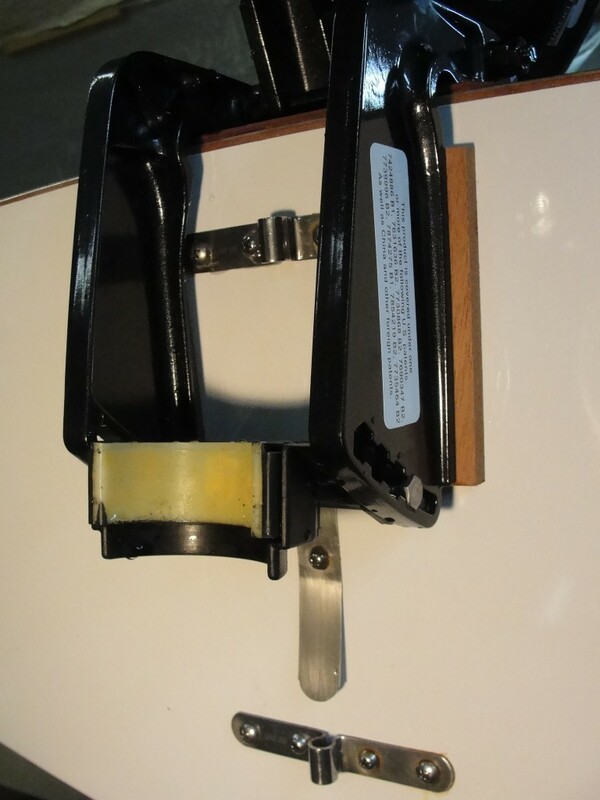 The block and pads are to prevent crushing or denting the hull skins when tightening the clamps. For a motor this heavy, we recommend re enforcing the transom with vertical ribs adhering to the buoyancy tank walls and butting up to the underside of the inwhale. This would be light and effective. VII. Conclusion: In general, if you are set on mounting a motor on the PT 11, it is preferable to choose a motor that weighs less than 30 LBS. We will be making some effort to mount and test drive the Electric Paddle in 2014. Note: If any of our builders have tried a small outboard on your PT 11, please contact us with your experiences. UPDATE: This information was sent to us from one of our builders in Florida. The HP used exceeds sanctioned HP for this boat but the results are informative. "Today's Sea Trial: Salt water, 75 degrees, sea level, iPhone GPS. POWER: 2.5 HP (rpm restrictor removed to increase to 3.3 hp), 1990 vintage two stroke, factory propeller, 27 pounds, Mercury outboard with tiller extension. Life jackets, paddle, no additional gear. Top speed, one 140 pound operator, 10 mph. Top speed, two people 330 pounds, 8 mph. Top speed, four people 810 pounds, 6 mph. Ideal cruise "sweet spot", two people, 6 mph.